Some of my favorite hours are spent watching really, really awful television. When the always something of parenting finally closes shop, but Bernie is still stuck wrist deep in other women, it’s time for a bit of guilty pleasure viewing. And when my husband isn’t planted on the opposite couch to groan when the remote pauses on something my 9 year old would describe as, “mmmm… smootchy, smootchy,” then I’m watching Peggy Sue Got Married. For, like, the 17th time. I just love teenagers… even when they’re portrayed by 30 year olds. It’s a confusing time: electric and fleeting and wonderful and awful and the perfect stuff to fold into a potpie of sentimentality. And Peggy Sue opens with her 25th high school reunion. The dork millionaire, the paunchy footballers, the receding hairlines, and the provocatively dressed divorcées contribute to an atmosphere that supports the awkward and silly conversations between people who knew each other way back when. The Death of the High School Reunion has been chronicled by better writers many times, but this year is my 25th reunion, and no more than a dozen graduates of the Class of ’89 will commit to a few hours of cash bar and greasy apps in the name of nostalgia. From the thread of RSVPs there are many “we don’t come ‘home’ for the holidays anymore” sentiments, maybe one “yay, reunion!” affirmation (mine), and a smattering of lackluster “maybe I’ll stop by” messages from people transparently choosing any other activity over seeing the Class of ’89 in three dimensions. Certainly, the very idea of Reunion holds its own mixed bag of cheery anticipation coupled to the dread of forgotten names, forced merriment, and the eleventh hour desire to drop 20lbs. I could list 194 reasons to blow off the reunion. But not too long ago, the 25th would be momentous enough to form a committee, launch a save-the-date, order some balloons, and hire a DJ to spin the music that accompanied our lost virginities. In response, alumni would half-heartedly complain, but still plan to go, switch shifts, get a babysitter, and maybe even alter the family holiday plans for it. I mean, it’s the goddamn 25th reunion. This is the one you go to, right? Nope. Turns out we’re “caught up” since our social media sites have already chronicled our births and deaths and accomplishments, new cars, cancer battles, wisdom tooth extractions, and kitchen remodels. Or maybe we’re worried our Facebook selves won’t quite live up to the brand we’ve created? Who knows? But no one is coming. Possibly because social media did not yet exist, we had a fantastic turnout at the 10th. “Ahh… the 10th,” said my wise brother-in-law, Bob, “Everyone is still lying.” I loved that. We filed into the decorated ballroom intent to prove we were becoming Important in the World, while shamelessly dancing to Debby Gibson, and kissing the boys we wished we had kissed way back when. Or maybe that was just me. It was a fuzzy night. At our 10th very few had any real responsibilities and we were all too happy to escape a night on the air mattress at mom’s in order to spend a few cash bar hours together. But 15 years later… hmmm, maybe I’ll stop by. Because no one really wants one, it looks like the Class of ’89 will have no formal venue to reunite: no balloons, no blown up yearbook photos, no Debby Gibson. Is this a huge tragedy? Not really. But I think we’re missing something when we forgo traditions like these. There’s a reason why it’s so much fun to squeeze and giggle and laugh and wiggle with the people who knew 16 year old you. It’s because they still see 16 year old you. And for the briefest of moments, you are still 16 year old you. That’s the fun of it, and the actual real-time, 3D catch up is just icing on the nostalgia cake. 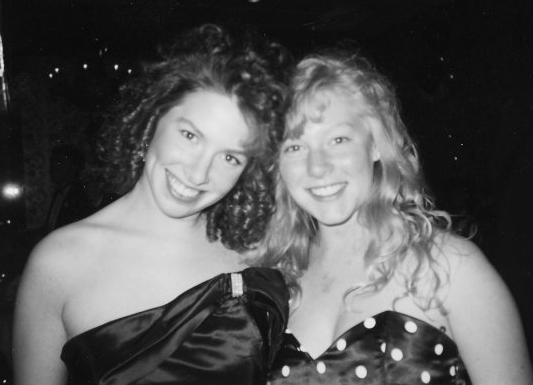 Prom 1989… me and Lisa, my BFF (split heart necklace and everything) and someone I’d LOVE to see in 3D.